Can you improve one of the best padlocks in circulation? 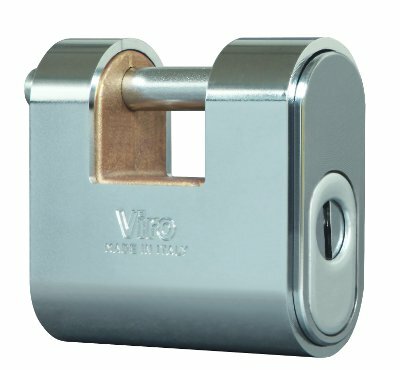 We in the industry do it for professional bias, but anyone can take a quick glance at the padlocks which close the shutters of our towns and cities and see that very often it is a Viro Panzer type; they are unmistakable due to the characteristic rounded shape, which makes them particularly difficult to grasp with burglary tools. A Viro Panzer armoured padlock. The reason for success is essentially the extremely high level of security offered by Viro Panzer padlocks compared with a undoubtedly acceptable cost. Viro Panzer padlocks may be ordered so that they open with the same key (i.e. in keyed alike mode), or which, whilst each has its own key which is different from the others, can also be opened by a master key. What would happen if I wanted to open my Panzer padlock with the same key that opens the padlock of another brand? Until now this was not possible. For this reason, Viro has made the Panzer padlocks so that they can be used with any type of half cylinder with a European profile. In this way it is possible to fit the Panzer padlock with a half cylinder compatible with the other locks that you want to include in the system. This basically means you can match the protection offered by the Viro Panzer armoured padlock with any other lock which uses Euro profile cylinders and half cylinders, regardless of the brand. The new Viro Panzer armored padlock for roller shutters designed to operate with any European profile half cylinder. What happens if I have to change the keys? 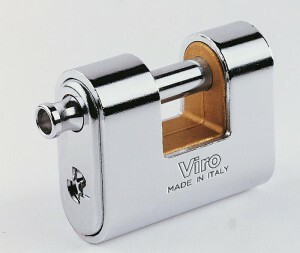 In the traditional Viro Panzer padlocks, where the “armour” is press-fitted on the body, unlike for example the one-piece Monolith padlocks, you cannot change the cylinder or bitting if you want to change the key, if, for example, some original keys have been lost and/or because it is feared that a thief has got hold of one. The problem is made worse if the padlocks concerned are more than one with the same key, for example, those which close the shutters of one or more shops. In this case, the replacement of all the padlocks would entail a considerable expense. The new Viro Panzer padlocks designed for half cylinders resolve this problem, because they allow the cylinder to be extracted, with the padlock open, and therefore change it or change the combination of the pistons, depending on the height of the teeth of a new key. A Viro Panzer padlock with the support for the half cylinder open. The replacement of the half cylinder is particularly simple; just unscrew the fixing screw using a common Allen wrench (provided). 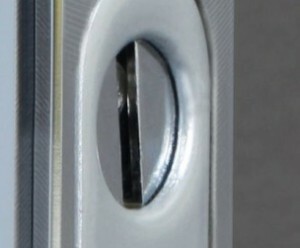 The screw is accessible, only with the padlock open, through the hole located on the lock-bolt extraction side. When the padlock is closed the hole is obstructed by a hardened steel plug which makes the fixing screw inaccessible. With the padlock open the hole that leads to the fixing screw is open. 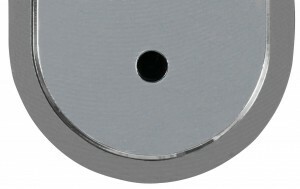 With the padlock closed the hole is obstructed by a drill-resistant hardened steel plug. A further advantage of the Viro Panzer padlocks with half cylinder is the protection against attempts to drill the padlock provided by the special rotating anti-drill plate, which provides an even greater security than the fixed one of the traditional Panzer padlocks. In case of attack, in fact, the rotating plate rotates together with the drill bit and does not allow it to grip or penetrate. The rotating drill-resistant plate of the Viro Panzer with half cylinder. Being able to install any European profile half cylinder means being able to also use particularly secure cylinders, such as patented profile cylinders or high security Viro Palladium cylinders and means also being able to use half cylinders with and anti-withdrawal cams in accordance with DIN standards, which offer an additional protection against attempts to force the cylinder. Even an already excellent product such as the Viro Panzer can be improved. Thanks to the fact that it is now also available for operating with any half cylinder, it provides maximum flexibility to create autonomous keyed alike systems, and to change the bitting and the keys. This entry was posted in Padlocks and tagged home, products, tips on 6 October 2015 by Mara Rossi. Hello , I do believe this is a great site. I stumbled upon it on Yahoo , I shall return once again.